Every year Side by Side throws an alternative prom for youth. This prom is a chance for people of any gender identity or sexuality to express their unique and groovy selves in a safe environment. Everyone is invited to come and be themselves—whether it be a group of friends, a couple, or someone looking for other LGBTQ+ youth like them. This year the theme is disco, a bright and happy era filled with music and self-expression! Alternative prom helps LGBTQ+ youth enjoy the glamor and milestone of high school prom, without the negatives that some schools still enforce. While some schools are more accepting, others are still discriminatory, and have rules that target their LGBTQ+ students. We believe that everyone should be able to wear the clothes that correspond with their identity and go with whoever it is they cherish. Even though some schools don’t have written policies preventing people from this authentic self-expression, the environment may be still hostile and unwelcoming, and keep youth from feeling comfortable enough to truly enjoy the night. Side by Side is proud to offer the RVA Alternative Prom—safe and welcoming for all! 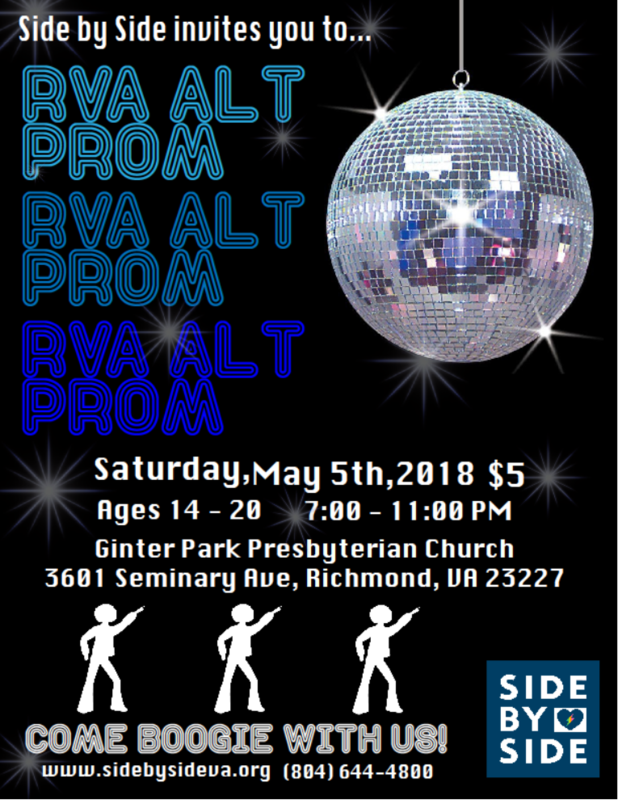 Side by Side’s RVA Alternative Prom will be help on Saturday May 5th, from 7 pm – 11 pm at Ginter Park Presbyterian Church. Admission is $5. Click here to RSVP on Facebook - https://www.facebook.com/events/1892607457439112/ . Side by Side is also supporting the Charlottesville UnProm sponsored by C’Ville Pride on Saturday, May 12th at Kitchen Catering – Click here to RSVP on Facebook https://www.facebook.com/events/410862726028223/.